It is mid 19th century Europe. The railroads that first appeared in England are now appearing on the European mainland. Wealth and prestige await the player who can tap into the resources and demands of the continent. Do you build through the mountains of Southern Europe, or across the expanse of Western Russia? If you are fortunate enough, maybe you can sign a charter agreement with a strategically located town or even a capital. A continent awaits for the Railways of Europe. 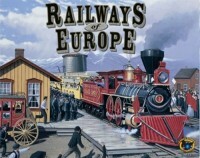 Railways of Europe is an expansion map for Eagle Game's very popular railroad game. You will need the pieces from the basic game (track and city tiles, shares, money, empty city markers, trains and first player marker) to play Railways of Europe. The Europe map makes for a very tight environment when playing with 4 or more players. This makes it a much more cutthroat game then the Eastern or Western US maps. You will find yourself fenced in and unable to access several major cities in western Europe if you are not careful. That being said, this is a very fun map to play if you love the Railways series. It involves a little more strategy then other maps, since in Western US for example, you have a lot of room to stretch out and try other options for deliveries, but in Europe you have to get creative to outmaneuver your opponents. Bidding for turn order here affects the game even more then before since the map has so many contested hubs. It’s a fantastic map to add to the game, and highly recommended. Add a Review for "Railways of Europe"